An Insight-commissioned IDG survey reveals what progress has been made, which hurdles are proving most difficult, and the role of leaders on the IT transformation journey. The magnitude and complexity of the IT transformation required by businesses can be staggering. But, those who don’t take action risk falling behind. IT transformation is a journey. IT leaders will face challenges and unchartered waters throughout their journey. However, IT leaders must persist — no matter the challenges — and play a strategic role in advancing their business in the digital age. As business needs change, so must IT. While this is difficult for the majority of organizations, those with 10,000 or more employees struggle the most. Get the full picture of the state of IT transformation. Of those we surveyed, more than 6 out of 10 rank legacy systems as the top barrier to transformation. Drill down into what causes aged infrastructure to mire transformation efforts. Having a cloud strategy is valuable — having the right cloud strategy appears to be an accelerator.  Organizations who have made great strides in IT transformation are far more likely to employ a hybrid cloud strategy. 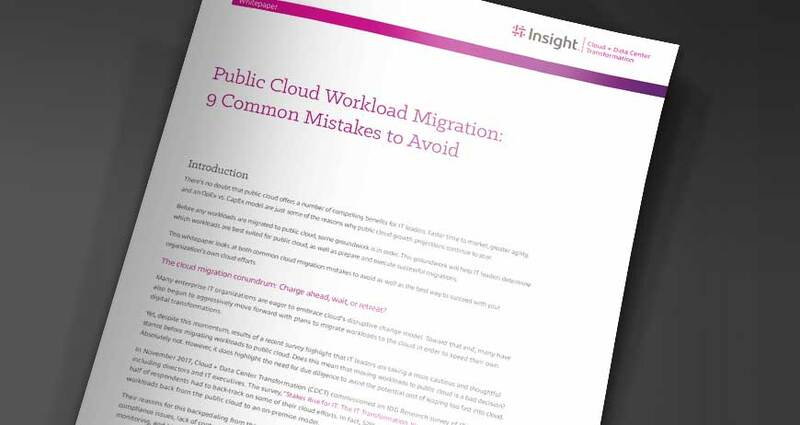 Whitepaper: Ease cloud strategy execution by avoiding the 9 most common mistakes made in public cloud migration. Case study: A financial services firm embarks on IT transformation, leaving behind two aging data centers. 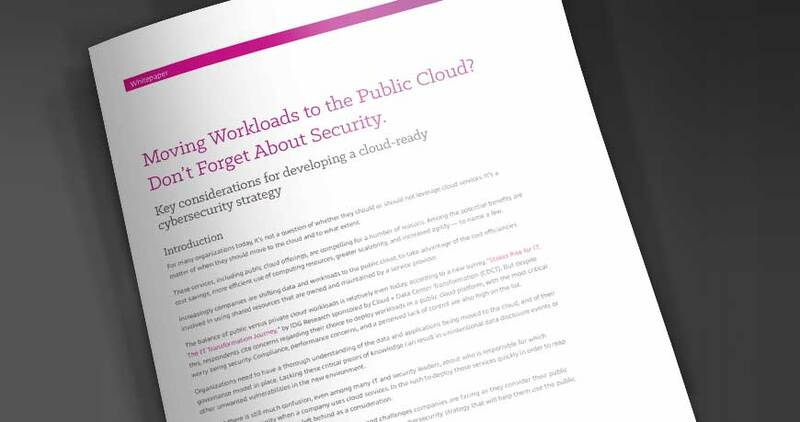 Whitepaper: Secure your public cloud workloads starting with migration, with helpful strategies and best practices. 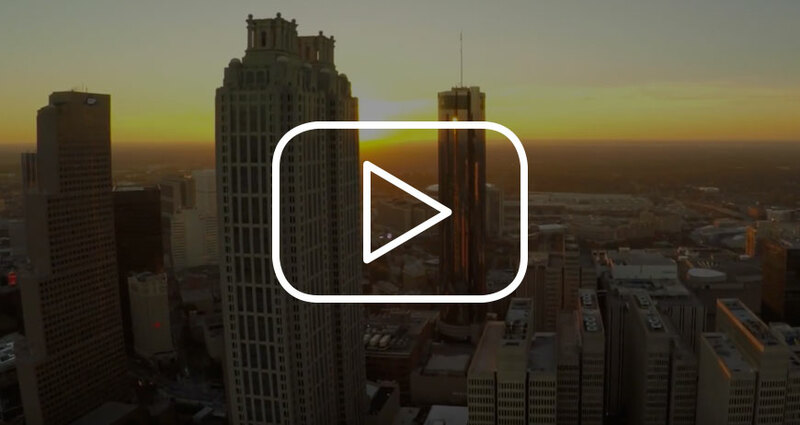 Stay ahead of the curve and take action on your IT transformation. Let us help.